NASA today officially cleared the space shuttle Discovery forits final mission, setting the stage for a Nov. 1 blastoff to cap the orbiter'sspaceflying career. Top NASA shuttle officials cleared Discovery for its launchnext week during an hours-long meeting at the Kennedy Space Center in CapeCanaveral, Fla. The approval came after technicians replaced two seals in a leakyfuel line for the twin orbital maneuvering system engines near theshuttle's tail. ? "We set the launch date for Nov. 1," NASA's spaceoperations chief Bill Gerstenmaier said in a press conference today (Oct. 25)from Kennedy Space Center. "We see a pretty much normal flow from nowthrough Nov. 1." The shuttle is due to lift off that Monday at 4:40 p.m. EDT(2040 GMT) on a mission to the International Space Station. Shuttle technicians completed repairs on Discovery today.Engineers were able to carry out both seal replacements with Discoverymaintaining its vertical configuration on the orbiter's seaside pad. "It's a huge testament to the team doing thework," said Mike Moses, head of NASA's mission management team forDiscovery's flight. "Everybody did an amazingly good job of workingthrough that issue." After the leaky seals were swapped out, technicians refilledDiscovery's four orbital maneuvering and reaction control system tanks withpropellant and proceeded with other standard pre-flight maintenance. Meanwhile, the six-astronautcrew of the upcoming STS-133 mission is expected to enter quarantine, asper normal procedure, this afternoon at Johnson Space Center in Houston.? Commander Steve Lindsey, pilot Eric Boe, and missionspecialists Michael Barratt, Nicole Stott, Alvin Drew and Tim Kopra will flyaboard Discovery on its last mission to the InternationalSpace Station. They will be taking critical spare parts to the station,including a storage room and a humanoid robot helper to assist the crew of theorbiting outpost. The shuttle is currently slated to launch on an 11-daymission. Two spacewalks are planned during the flight. The mission will beNASA's 133rd shuttle flight since the agency's orbiter fleet began flying inApril 1981. Speaking about Discovery, shuttle launch director MikeLeinbach, noted the bittersweet nature of the orbiter's final spaceflight. "I think the word you hear in the halls of KSC andprobably every other center, is that it's still kind of hard to believe," Leinbachsaid. "[The shuttles are a] part of history, part of American culture. It'llbe different without flying the shuttle. But, we need to do what we need to dofor the agency. We need to get on with the final flight and make it the bestflight ever." 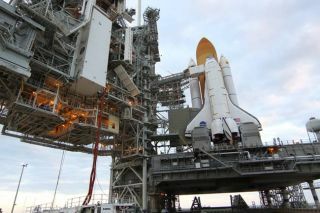 The shuttle Endeavour will follow Discovery's flight withone last mission of its own in early 2011. A third, extrashuttle mission has been approved by Congress and President Obama, and isdue to be reviewed by congressional appropriators later this year. NASA will retire the three remaining shuttles ? Discovery,Atlantis and Endeavour ? next year to make way for a new plan aimed at sendingastronauts to visit an asteroid and Mars. Discovery is the oldest of NASA'sspace shuttles and has made more spaceflights than any other orbiter fleet. President Obama recently signed a major NASA act into law thatscraps the space agency's previous moon-oriented goal and paves the way for amanned mission to an asteroid by 2025. A manned mission to Mars is envisionedfor some time in the 2030s. The authorization also calls for a budget of $19 billion forNASA in 2011, adding one extra space shuttle flight before the fleet retiresnext year, and the extension of the International Space Station through atleast 2020.